There is a museum in Aarhus which is called Den Gamle By or at least I think that’s its name. That’s what the sign on the door said, but on thinking about it that might be Danish for “queue here for tickets” . We are getting better at recognising some words even if we don’t have a ghost of a chance of pronouncing them, so we queued under the sign anyway and everything seemed to work out. The museum is one of those living villages where buildings have been transported from other places and reconstructed. We’re generally not museum junkies although we thought we’d seen the likes of this on at least four continents. This one is a bit different though. It is divided into three parts, recreating eras from 17/1800, 1927, and 1974. The latter two were made even more real by the use of interviews and slices of the lives of the people who actually lived and worked in the buildings. It did come as something of a shock to discover that we were married in a year that is now so long gone that it has historical value. Imagine how we felt rediscovering everything that was so familiar it was almost spine tingling. If we had forgotten tiny details of our lives back then, the curators of the exhibits had not. Nothing was missed in perfectly recreating the era. The plumber’s workshop for instance featured all manner of tools in racks, with photographs of somewhat immodest young ladies pinned among them, in curious juxtaposition perhaps with the reconstructed gynaecologist’s surgery just two floors above, itself resplendent with overflowing ashtrays in its waiting room, cigarettes no doubt purchased from the vending machine on the footpath outside. 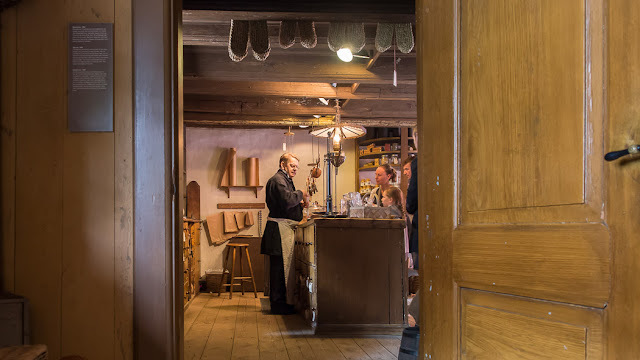 While in Denmark the plumbers’ photographs are considered to be simple historical artefacts, it is just possible that they could raise an eyebrow or two in polite company elsewhere, so a photograph of the general store from 1800 will serve to remind us of the day, while those of the plumbers workshop if in fact they exist, will be preserved for the benefit of consenting adults in private.